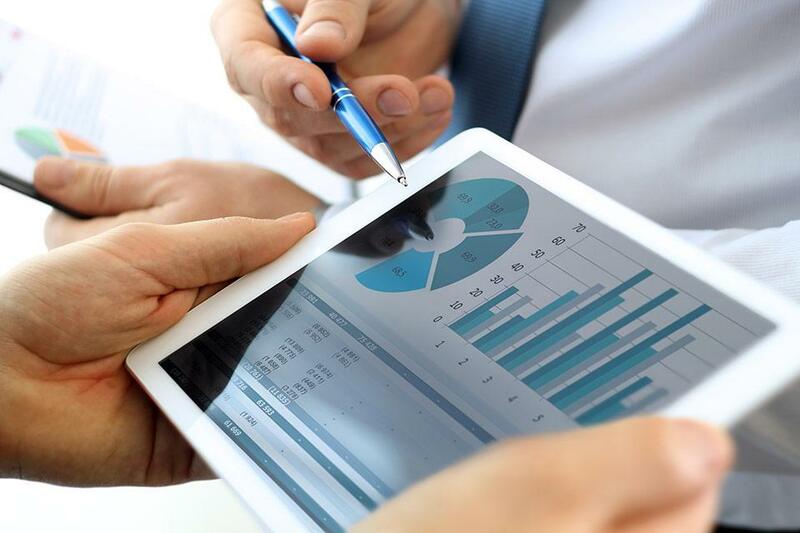 Trade associations and waste management companies can benefit from tailor-made sectoral and regional analyses. Thanks to our unique position within the system for waste collection and sorting, we have data from the register entries of waste collection services affiliated with the Valipac system. Since 2018 we have been identifying and analysing waste production per collection point and per type of material. Our Sorting Barometer is the only statistical tool that has this kind of data for the whole country. It goes without saying that we protect the confidentiality of individual records provided by the waste collection services. In return, by aggregating the data, we can also offer tailor­-made market surveys per region, per material, per business sector, etc. How can this activity help me? 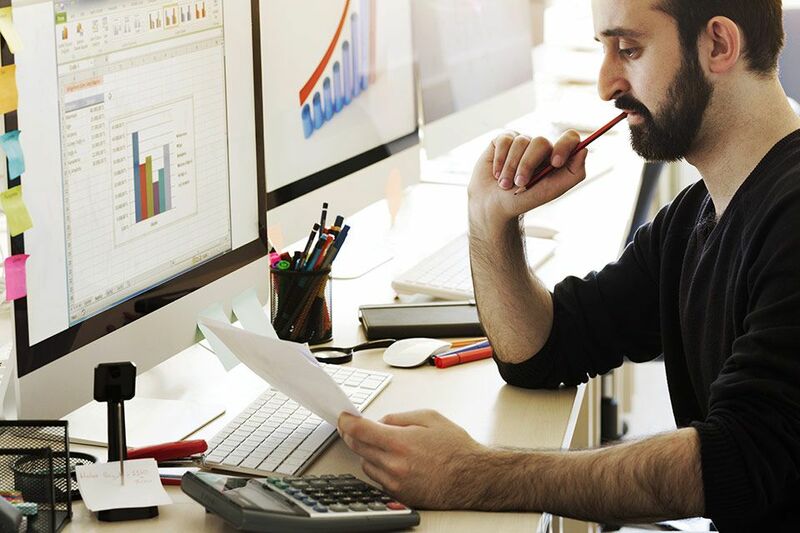 As an operator affiliate of Valipac, you communicate the information that is relevant for your business. In exchange, you hope to derive some commercial benefit. Yes, that is possible! Corporate social responsibility, sustainability, green economy, circular economy, etc. These concepts are becoming increasingly important in our society and have become inseparable from today’s business economy. How many businesses in your sector are sorting their own waste? What kind of waste products are they sorting? developments observed in other economic sectors. 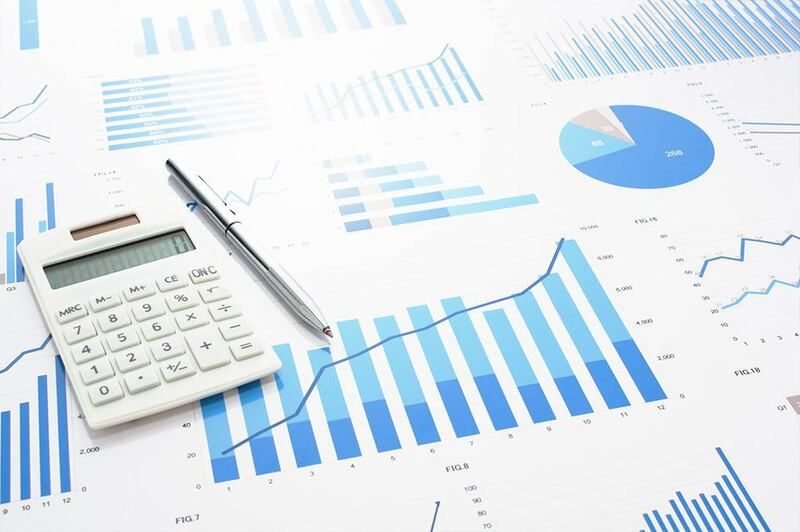 Our tailor-made reports and surveys can provide you with detailed answers to these questions on the basis of comprehensive and reliable market statistics. Using the data that we have collected, we are identifying possible avenues for improvements in sorting waste and keeping the parties concerned informed: government authorities, trade associations, and the waste collection services affiliated to Valipac. Pooling our efforts, we are carrying out a series of awareness campaigns and actions adapted to different situations and targeting specific audiences. We have developed a starter kit to encourage businesses to sort their plastic film waste: a small cardboard containing an explanatory leaflet and three bin bags for beginning waste collection. Once these are full, they are picked up for free at the same time that the paper/cardboard container is usually emptied. The idea is to show that the separate collection of plastic film waste is feasible, practical, and easy to execute. Our studies show that businesses operating in the wholesale and retail sectors generate very large volumes of plastic film waste. Drawing on our databases, we can see which businesses are actively sorting, and which are not. Working together with the affiliated waste collection services, we have distributed over 5,000 starter kits to the non-sorting clients. Any business won over to this system is invited to order new supplies of these special collection bags from their waste collection service. Encouraging the separate collection of packaging waste and increasing its recycling rate are both priority areas for Valipac. However, this separate collection must not be made in a haphazard manner. The film waste must be correctly sorted to make it suitable for recycling. If improperly sorted, this waste will be disqualified and will not be recycled. Valipac’s affiliated waste collection services often discover contaminants in the sorting bags meant for plastic film: glue, pieces of cardboard, PET drinks bottles and PP drinking cups, to give just a few examples. 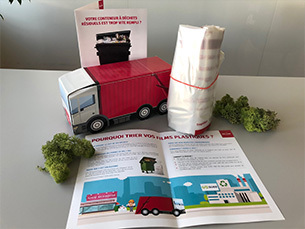 Working together with the waste collection sector, Valipac has set up an awareness campaign designed to remind everybody of the principles for high-quality sorting of plastic film. 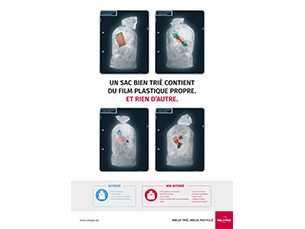 This campaign, with the slogan “Only clean plastic film goes into a properly sorted bag. Nothing else” has been sent to all our partners’ business clients that use these bags for collecting plastic film. Some communication materials and advice can be found at the website jetriedansmonentreprise.be, which will help clients to remember the rules for sorting about 15 different waste streams.